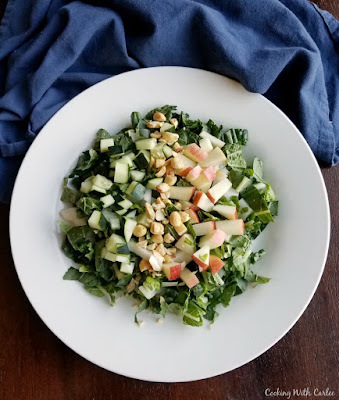 This salad is full of crunch and flavor. 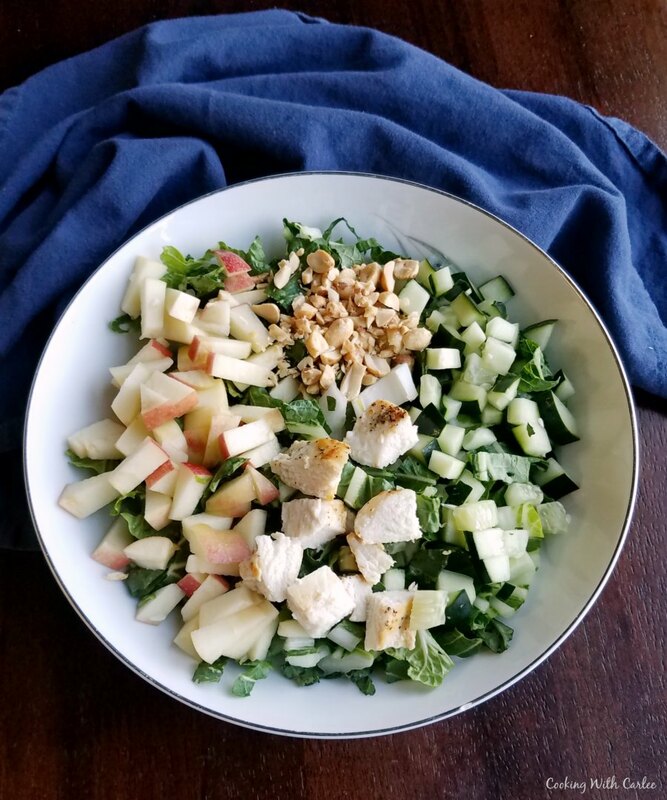 Apples, cucumbers and peanuts are layered over bok choy and drizzled with a peanut butter yogurt dressing. I was so tempted to cook the bok choy we got in our veggie box. I love it in stir fry or cooked with garlic amd soy sauce. I also saw so many tasty looking recipes for roasted and grilled bok choy. But my husband very much prefers raw cabbage to the cooked variety. Though he does eat Carlee's cabbage (a family name for a dish we really enjoy!) Plus I've never eaten bok choy in a salad. So it seemed like the right thing to do. If we hadn't just had grandma's napa salad recently, I would have been reworking that into something new. We just love the flavor and crunch and it is so simple to make. But since we had just had some, it seems like something different was in order. We had a bag of apples in the fridge drawer and it seemed like that would add a nice bit of sweet to the bok choy. We also got a couple of cucumbers in our CSA box that were just begging to be added for that fresh burst. While the dressing from that napa salad would be delicious on this as well, I wanted to try something new. 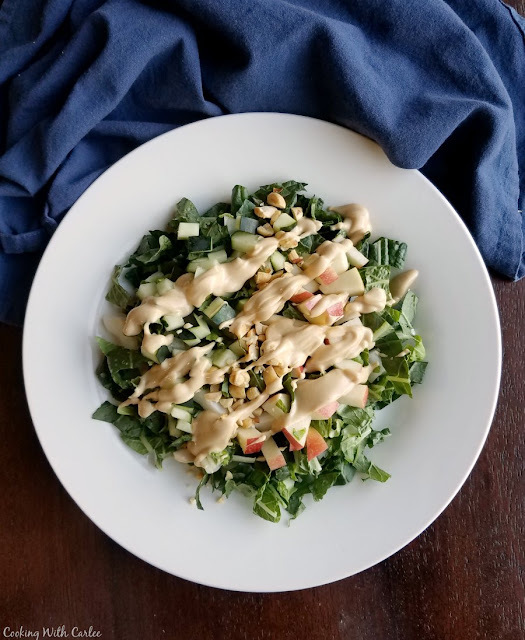 This peanut butter and yogurt salad dressing was the perfect thing to bring it all together. It really worked nice with all of the other flavors. My husband is not a huge fan of peanut chicken, or anything peanut butter without chocolate really, so I wasn't sure how he'd like this. It turns out he was a big fan! I've been winning him over with salads lately and they have been a great way to get dinner on the table on these hot busy days. 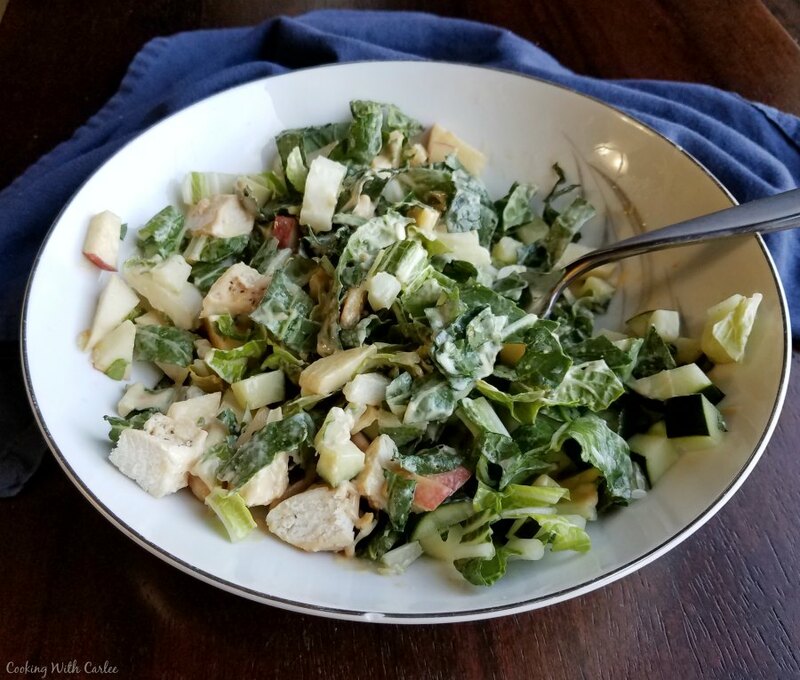 Of course this would make a great side salad, but like most salads lately I added some chicken and made it an entree instead. Either way it's going to be good! The veggie boxes are keeping us loaded up on greens. So what are your favorite ways to use them? I have a few more fun things coming if they work out the way I have them envisioned! Mix all of the salad dressing ingredients together until uniform. Adjust seasoning to taste. If it is too thick for your liking, add a splash or two more vinegar or water. Wash bok choy and cut into thin strips. Chop the apple, cucumber. and peanuts. Layer salad with greens, toppings and drizzle with dressing. Add cooked chicken breast if desired and serve! I can’t wait to try this! I love peanut butter and apples together. Me too and this was a fun, more savory twist on that! 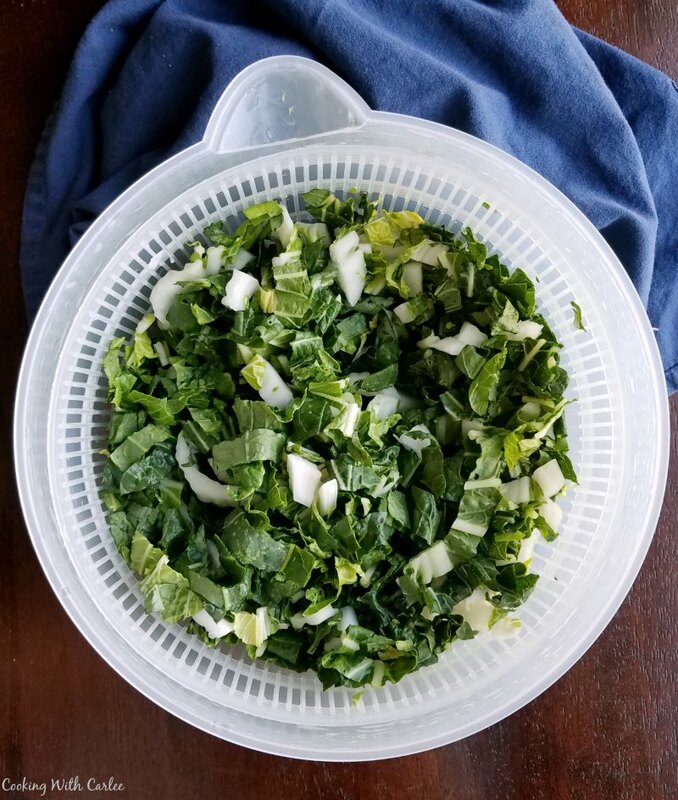 When I was in grade school my mom worked a Chinese restaurant waitressing at lunch during the school year so I was introduced to Bok choy early and still love it to this day. What a great salad! Happy Monday sweets! I love it in stir fries and soup, I've never made a salad with it until now. I can't wait to try more! This sounds delicious! I could eat that dressing by itself :). Have a great week, Carlee! It would make a great veggie dip too... but a spoon always works! Thanks, Kelsie! This looks so delicious! Pinned and shared. We really enjoyed it, thank you! I'm anxious to try this peanut butter dressing. We do like peanut butter but have never had it on a salad. You are definitely getting me out of my comfort zone! It's fun to get out of that zone every once in a while! I hope you like it! 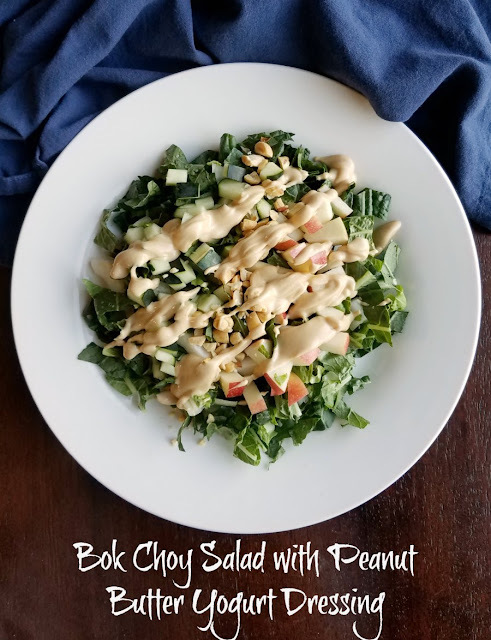 This looks fantastic- I love a peanut butter dressing! I think this one is quickly becoming one of my favorites! Carlee, I bet this salad is amazing! The dressing sounds so good with the peanut butter. :-o Thank you for sharing it at the Whimsical Wednesdays Link Party. It was so good. 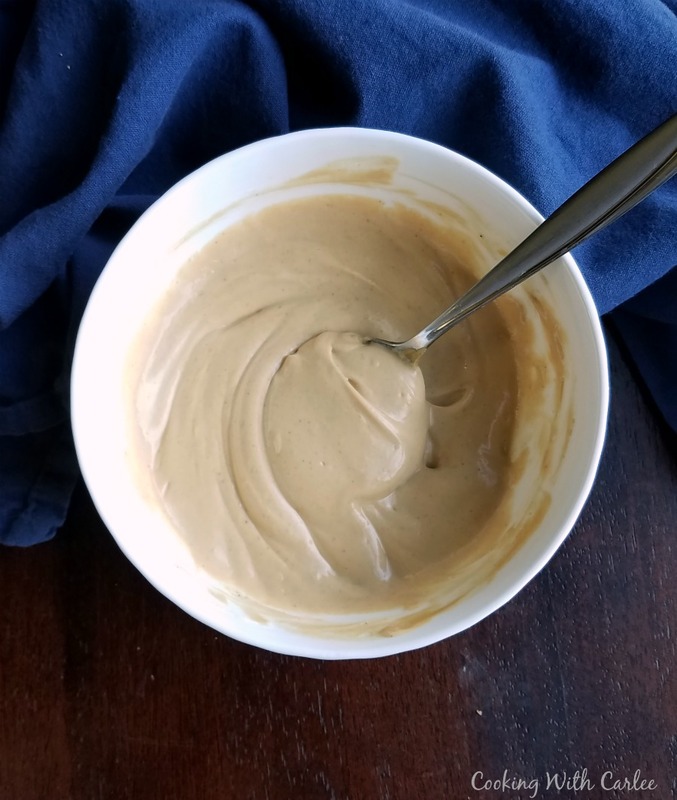 I am a sucker for all things peanut butter, so the dressing won me over too! Thank you! I hope they do! It's so fresh and flavorful!